I recently met investment analyst and author Masuda Etsusuke, who has written such books as The Introverted Global Empire: The coming Japanese era, and Japanese Civilization: The world’s most powerful secret. I greatly respect Mr. Masuda as one of the foremost commentators on contemporary civilization in Japan today. Indeed. Certainly, the lifestyle of the current (as of now) global empire America spread rapidly throughout the world starting in the 1950s. After the Second World War, the people of Japan also became infatuated with the American lifestyle through television and other means, and imitated them en masse. Our lifestyle today owes a substantial amount to the influence of the global empire America. After all these years, it goes without saying that in addition to television, Hollywood movies have contributed greatly to the spread of the American culture and lifestyle. The culture of the former global imperial power Great Britain has also become a part of our daily lives. The suit of clothes I’m wearing now is a product of British culture, as is my necktie. The Hornblower Series by C.S. Forester has a scene in which the hero struggles with his necktie, which had just become popular, but that novel was set during the Napoleonic Wars. The necktie had already been created in Britain in the early 1800s and had begun to spread around the world. The same is true of the sandwich and the cardigan sweater. The sandwich was created by John Montagu, the Earl of Sandwich, and the cardigan sweater by James Brudenell, the Earl of Cardigan, two members of the British nobility. To return to the present, the candidates are surprisingly limited when we consider which global empire will follow that of the United States. For example, do any readers wish to imitate the Chinese lifestyle? Well, there are plenty of faddists in the world, so I can’t say there are none. Nevertheless, I suspect only a very few would agree that China is a candidate. In the past, during the age of official diplomatic delegations to the Sui and T’ang Dynasties, Japan did in fact enthusiastically incorporate (elements of) Chinese civilization. In that sense, both of those dynasties were surely global empires at that time. But that is now in the past. Regardless of how one views the situation, I do not think most people in the world want to imitate the lifestyle of China, now controlled by the Chinese Communist Party. In that case, what about the following country? Rather than clean, they are fastidious. The gap in knowledge between the so-called elites and the general public is microscopic. Indeed, the (knowledge) levels are reversed. It is an extremely rare country in which the masses are sharper than the elites. Its language, culture, and entertainments are shared by all throughout society. The prime minister, the nation’s foremost politician, and a young, job-hopping part-time worker could have a conversation about the same subjects. The railroads run on schedule down to the last second. People can move about in the cities without an automobile. Because everyone moves about on foot, the crime rates are significantly lower than that of other countries. Though its unemployment rate is among the lowest in the advanced countries, there is a sense of lethargy both in the economy and society. People are withdrawn, but enjoy highly original content that no other country in the world can imitate. In short, that country is Japan. Masuda Etsusuke asserts that it is Japan which fulfills the conditions to become the next global empire. If you would disagree and argue that it couldn’t possibly happen, I urge you to watch this video. The Japanese-language note at the bottom of the video says that 64 countries and territories are presented. If you are using IE and have a problem, try compatibility view. For the full impact, watch it to the end. NO, THAT TITLE didn’t come from my hyperactive Nipponophile imagination–it’s the actual headline from a Business Week article written by Ed Wallace, an expert on automobiles and the auto industry who runs this aggregator website. Mr. Wallace begins his article with this consumer complaint about Toyota. The article is worth reading because the author dismisses the sensationalism and seeks a grounding in the facts. At the Gulf States Toyota mid-winter meeting, attended by more than 150 dealers, an official asked for a show of hands of any dealers who’d ever had such a complaint in their service department prior to this story breaking nationally. And in this closed meeting, according to three dealers who were present, not one dealer raised a hand. Furthermore, why didn’t Congress simply ask Toyota to provide a complete list of all warranty claims on this complaint made before the media made their serious allegations? That would have taken this issue out of the realm of speculation into one of hard facts. If only to resolve the rabid focus on Toyota’s problems, it’s past time to turn this over to the engineers. Innuendo, emotion, and speculation are not how one resolves an issue such as this. Even in the hearings in Congress, it appeared that most witnesses were tied to safety advocates, litigation attorneys, and traumatized victims; that’s like trying a case in court with no defense attorneys. The outcome is almost preordained. Another aspect to this story isn’t receiving much attention, but is in some ways as interesting as the original story itself. In the past, this alliance of interest-group hustlers, lawyers, politicians, and the old media would have easily carried the day. Those with objections to their claims, either in part or in toto, would have been ignored, dismissed, or demonized. Perhaps people have been aroused by the addition to the alliance of the new GM ownership team that consists of an unpopular and untrusted government and its labor union supporters. Perhaps it’s because the new technology-enabled environment in which issues are examined has achieved a firm foothold, now that the old media’s credibility is in tatters. It’s more likely the combination of those two factors, but regardless of the reasons, it’s clear that many people are throwing this scenario back into the face of the alliance that’s pushing it. That environment seems to be more fully formed in the Anglosphere than in Japan, perhaps due to the successes achieved in the former. In the United States, the new media swiftly took the scalp of CBS newsman Dan Rather during the 2004 election, and last year it exposed the warped and thuggish political action group ACORN. They’ve also provided the platform for the exposure of the fraudulent global warming claims. All the Japanese new media needs to join them is a scalp or two of its own. The stage seems to have been set, the lighting has been turned on, and the players are in the wings. Instead of Godot, they’re waiting for the catalyst. Thanks to Rick in Texas for the links. Come to think of it, there might be another reason for the pushback: A lot of Americans like their Toyotas. And, come to think of it, the Japanese new media might have one scalp after all–the Mainichi Shimbun in the WaiWai affair, when Japanese netizens brought the newspaper to its knees for the brain-dead material presented in that English-language feature from the usual spitballing, anti-Nipponist perspective. Both the print and broadcast sectors of the Japanese mess media kept strangely mum. IN 1984, when I first came to Japan, the one thing sure to cause the eyes of Western visitors or temporary residents in this country to roll, and the wise lips to wag, was Hello Kitty. In those days, there was a strange fellow in town teaching English in the JET program who thought the existence of the character was evidence of an intrinsic defect in the Japanese personality. He was inspired to design his own “Goodbye Kitty” t-shirt with an indelible magic marker. In his rendition, Kitty-chan wound up looking like she had too much to drink and came out on the losing end of a street fight. He was not much of an artist, and that contributed to the overall…effect, shall we say. He thought he was quite the wit and social commentator and wore the shirt constantly. His shirt failed to have the desired impact, however, because his personal hygiene left something to be desired. He seldom washed it–or bathed–so it became rather dingy and acquired a gamy odor. Naturally, people started avoiding him when they saw him on the street, and that further soured his attitude toward Japan. He returned to his homeland–not the United States–and went to work for a travel agency. The last I heard, he was selling package tours to Japan. Times have changed, however. I got an e-mail from a friend in England today, and he told me that advertisements for this began appearing on British television about two weeks ago. He’s done some web design, and so has add-ons to his Google page for search engine optimization. One of them counts the number of searches made for specific web pages. He reports this page has already received 29 million searches. I understand about the trend toward the infantilization of culture, and I know I’m not part of this age demographic, but still…29 million? Speaking of Kitty-chan, here’s a post from the first month of Ampontan in January 2007 presenting a theory on her origins as explained by Catherine Yronwode. Accept it or not, the theory is intriguing. THERE IS AN EXPRESSION in Japanese which combines the kanji for flower, bird, wind, and moon. Read kacho fugetsu, that expression evokes the appreciation of the beauty of nature. When used with a verb, it becomes a phrase that means “to follow elegant pursuits”. One might expect the rites of spring to be Dionysian, inspired by intoxication with heat, light, and passion after a cold winter, but the Japanese seasonal celebrations tend toward the Apollonian wth their incorporation of kacho fugetsu. For example, everyone knows that the floral symbol for springtime in Japan is the cherry blossom. The Japanese have long enjoyed the custom of holding parties under cherry trees in full bloom, and anyone who has been to a hanami at a large park understands that much of its charm is derived from an uncommon intensity of elegance. The custom is more than a millennium old, so the Japanese know just where to go. Thousands of local governments nationwide tout the prime cherry-viewing sites in their jurisdiction for tourists. Nowadays, partygoers can plan their excursions in advance because the weather bureau provides reports on the “cherry blossom front” as it moves northward and eastward up the archipelago. The print and broadcast media present these reports as news. There is a less well-known floral harbinger of spring, however, that arrives even earlier than the cherries—the ume blossoms. Commonly called a plum in English, the ume is more closely related to the apricot, is not eaten raw, and neither looks nor tastes like Western plums (for which a different word is used). Ume trees were brought to Japan from China in the 8th century, and according to ancient belief are capable of warding off danger. No matter how modern their outlook becomes, northeast Asians are careful to take heed of feng shui principles, so these trees are often planted in the northeast corner of plots. That corner is known as the kimon, or demon’s gate, the entryway for danger and evil. Is there a more elegant way to beat the devil than blossoming fruit trees? There is even the custom of plum-viewing parties, though they are are less well-attended. February in the Northern Hemisphere is not the best time for a poetic picnic. Ume trees grow throughout the country, but everyone knows the best place for plum viewing is the Kitano Tenman-gu, a Shinto shrine in Kyoto. The shrine has a garden with more than 1,500 plum trees of several varieties of red and white flowers, which happily are the same colors as the national flag. 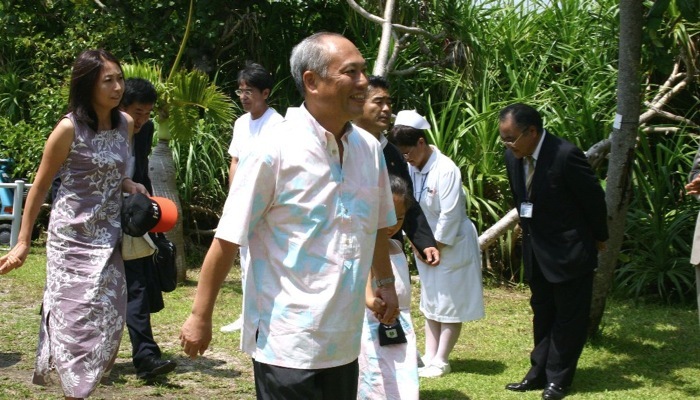 Everyone also knows when to plan the trip because the event at the shrine is held on the same day every year—25 February, the anniversary of the death of the enshrined deity, Michizane Sugawara. Ume blossoms were said to be his favorite. Then again, it’s unlikely that anyone would forget. The shrine dates from 947, and the plum viewing parties began a century or so later. In other words, it’s been part of the social calendar at the same time and same place for more than 900 years. 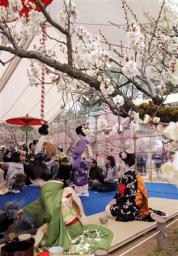 The viewing of the plums comes later in the day, and it is enhanced by flowers in human form–30 geisha pouring tea and offering sweets for JPY 1,500 (about $US 16.80) a serving along a stretch canopied with blossoms. The outdoor part of the ceremony is much newer, dating to 1952. Kyoto outdoors can be very un-spring-like in February, but this year the air temperature was 15.2°, five degrees warmer than normal for this time of year. The geisha make a special trip for the occasion from the next-door Kamishichiken district east of the shrine. It’s the oldest geisha district in northwest Kyoto. Geisha districts, by the way, are known as hanamachi, or flower town. Kamishichiken itself has particularly close ties with the shrine. The name means “seven upper houses”, and it refers to seven teahouses built there using materials left over when the Kitano Tenman-gu was rebuilt centuries ago. For more photos, try these Japanese pages from the shrine’s website. (The link above is to their English page.) Then consider: Is not this annual custom the very essence of an elegant pursuit? Lay not that flattering unction to your soul. FINANCE MINISTER KAN NAOTO is going at it again about one of his favorite subjects—income redistribution. Give the man credit for persistence, if nothing else. And I do mean nothing else. (According to a panel of experts), the so-called income redistribution function of the income tax today has largely declined. For someone of Mr. Kan’s economic expertise to be concerned about the decline of the redistributive function of income tax is akin to a bamboo grove doctor with a medical degree from Xerox U. being concerned about a downturn in the number of diphtheria cases. Still, one cannot help but feel a slight pang of sympathy for Mr. Kan. After all, this is the first opportunity the Japanese left have ever had during their lifetimes to put their philosophy into practice before it boomerangs into their faces. The left in Western countries have had decades to polish their techniques to pretend that deep gash in the middle of their forehead doesn’t exist. As usual, Thomas Sowell says it best about income distribution, so we’ll quote him for the second time this week. This time it’s from his 1995 book, The Vision of the Anointed. “If one believes that income and wealth should not originate as they do now, but should instead be distributed as largesse from some central point, then that argument should be made openly, plainly, and honestly…..
Here’s what Mr. Sowell doesn’t say: If income redistribution were either beneficial or fair–not to mention both–then socialism would have worked. Ready for another lost decade? Kan Naoto seems to be. Monday brought news that Toyota’s government and activist opponents are piling on to a degree the Big Three may never have experienced, as “federal prosecutors have launched a criminal investigation into the company’s safety problems and the Securities and Exchange Commission was probing what the automaker told investors.” I don’t recall any Big Three executive or employee being subjected to a criminal trial relating to a product liability problem, but that possibility now appears to loom at Toyota — just in time to rattle its executives ahead of their congressional testimony. Finally, it’s more than a little interesting that Department of Transportation spokesperson Olivia Alair was available on Sunday night to tell the press that the Toyota presentation in question was a “very telling” indicator that the company might be placing its bottom line ahead of safety. What’s really “telling” about the kind of people Toyota faces is that as Barack Obama’s Ohio campaign director in 2008, Alair registered to vote in the Buckeye State even though she doesn’t live there, and was apparently ready to cast an election ballot until a county prosecutor threatened to drop felony charges on her and 12 other Obama campaign workers. I do hope that the folks at Toyota fully appreciate the ugliness they’re up against. If they don’t, they’re going to find out. There is a combined total of 59 Democrats serving on these two (Congressional committees), which hold potentially life-and-death power over Toyota’s ability to continue offering its products to American consumers. So far this year, 31 of the 59 have received re-election campaign contributions ranging from as low as $500 to as high as $10,000 from the United Auto Workers union. Why is that significant? Because the UAW is a major stockholder of Toyota’s top U.S. rival, General Motors. Also, Toyota has successfully resisted UAW attempts to organize the Japanese firm’s estimated 31,000 assembly line workers employed in five plants here in America. One reason for GM’s collapse was that bloated pension and health care commitments to retired workers meant they lost money on every car sold. Can Toyota avoid the clutches of the UAW vampires? Stay tuned. THAT’S THE TITLE of a new book by Xinran, which has been reviewed by The Spectator. There are roughly 120,000 adopted Chinese children living abroad with non-Chinese foster parents. She had lived and worked almost her entire life in orphanages, and told Xinran that little girls sometimes arrived there with scars between their legs. Oil lamps or candles had burned them. (W)hile the natural male-female gender ratio should be 103 or 104 males for every 100 females, in China, depending on the region, this varies from 110 to at least 130 males for every 100 females. One catastrophic result is a shortage of wives and the kidnapping of girls to be sold as wives in other parts of China. Chinese women also have the highest suicide rate in the world. Mother love is supposed to be such a great thing, but so many babies are abandoned, and it’s their mothers who do it. They’re ignorant. They feel differently about emotions from the way you do. Where I come from, people talk about smothering a baby girl or just throwing it[! ]into a stream … to be eaten by dogs, as if it were a joke. The content of the article speaks for itself. …(T)hey justify it because they are absorbed in the endless struggle to think well of themselves. THIS THOMAS SOWELL column directly addresses the question of apologies for slavery. It contains no mention of Japan, nor any reference to Japan’s behavior in the early part of the 20th century. Replacing the references to slavery in his column with references to Japanese behavior, however, would not alter the intellectual argument in the slightest. Slavery is too serious for an apology and somebody else being a slaveowner is not something for you to apologize for. When somebody who has never owned a slave apologizes for slavery to somebody who has never been a slave, then what began as mushy thinking has degenerated into theatrical absurdity— or, worse yet, politics. This craze for aimless apologies is part of a general loss of a sense of personal responsibility in our time. We are supposed to feel guilty for what other people did but there are a thousand cop-outs for what we ourselves did to those we did it to. Not only have aimless apologies become a craze, there are university professors who make a living at it by choosing historical apology as their specialized field of study. Why not? It’s a relatively easy way to obtain a measure of money and recognition unavailable to them otherwise. Had I the money and the access, I would have this article translated into Japanese, Korean, and Chinese and distributed to the political leadership in all those countries. Since it’s already in English, it doesn’t need to be translated for the anti-Nipponists and the Korean and Chinese sycophants in the West. Shimojo Masao (9): Tenno or Ilwang? THE SOUTH KOREANS use the term ilwang (日王, or Japanese king), to refer to the Japanese Tenno, or emperor. But in the Confucian cultural sphere, the political standing of a king and the Tenno were entirely different. That’s because the term tenno also is used to designate an emperor. It is not the same as a king, which implies the existence of a subservient nobility. Why is it that South Koreans insist on calling the Tenno, which is nothing more than a historical proper noun, an ilwang, thereby turning an emperor into a king? The South Korean explanation is that in the Confucian cultural sphere, the terms used for emperor, including tenno, are limited to Chinese historical dynasties that were suzerains. Using that word to denote the Japanese Tenno would place South Korea in the position of a Japanese vassal state. It is a historical fact, however, that the situation in Japan was identical to that of the Chinese dynasties. The “shogun in charge of conquering barbarian territories” established a military government of the samurai class, known as the bakufu, after receiving the sanction of the Tenno. It used the Tenno’s era name as the symbol of an independent state. A superior-subordinate relationship was maintained between the shogun and the nobility, or daimyo. The relationship between the Tenno and the shogun was a system of governance that closely resembled the vassal system in which the Chinese dynasties made vassals of the nobility from the surrounding states. During the Edo period, governance was established as a system with the Shogunate and feudal domains. Viewed from this historical perspective, there were two empires in the Confucian cultural sphere–China and Japan—and two people who were tenshi (天子, i.e., emperor, or the child of heaven). Located between China on the continent and the Japanese archipelago, the Korean Peninsula was historically subject to the geopolitical influence of those two states. However, the Korean Peninsula, which had long been in a subordinate position to the Chinese dynasty, was annexed by Japan in August 1910. The peninsula was liberated from Japanese rule with the latter’s defeat in the Second World War. A movement arose in post-liberation South Korea to restore the historical conditions of the past, and that led to the emergence of a historical awareness that pressed for a settlement of past issues. Because South Korea had historically looked up to China as the suzerain, they viewed Japan has having been in the position of nobility–identical to the position of the peninsula. Therefore, for South Koreans to refer to the Japanese Tenno with that term would be tantamount to an admission they were still under Japanese rule, which would wound their self-respect. The unique historical viewpoint of the Korean Peninsula, which holds that “this is how the history of the past should be”, has had a not-insubstantial impact on recent historical issues between Japan and South Korea, and South Korea and China. In South Korea, a contemporary historical aesthesis is used to evaluate history. That’s because they seek a settlement of the history of the past based on a historical viewpoint derived from that evaluation. Joseon achieved “absolute independence as a self-governing nation” as the result of the 1894 war between Japan and China. That meant Japan, which was the victor in that war, was compelled to recognize the independence of Joseon, for which the Qing Dynasty had been the suzerain. Therefore, in accordance with the tradition of the states of the Confucian cultural sphere, Joseon reinstituted the Greater Korean Empire in 1896, installed Gojong as the emperor, and established an era name. That’s why, in South Korea, the descendents of Emperor Gojong of the Greater Korean Empire are known as “imperial descendants”. In recent years, there have been discussions between Japan and South Korea about a possible visit by the Japanese Tenno to the latter country. If there were an opportunity for the Tenno to meet with Gojong’s descendents during such a visit, and the South Korean historical view of the Tenno as the ilwang remained intact, would the mass media in that country report that the “imperial descendants” had met with the “Japanese king”? History should not be cavalierly rewritten from the arbitrary interpretation of later generations. One obstacle when considering the establishment of an East Asian entity is a barren historical viewpoint based on a contemporary aesthesis that would go so far as to recreate the history of the past in conformity with present attitudes. Snap your finger and I’ll turn you some flips. All you gotta do is wiggle your little hand. Japanese Finance Minister, Naoto Kan, put further pressure on the Bank of Japan yesterday, telling it to do its part to fight deflation. “The government will do its part, so I want the BoJ to do what it should do,” Kan told reporters. “I have no wish to tell it to take specific actions. I am saying we should work together since we hold the shared understanding that we are yet to overcome deflation,” he said. He doesn’t want to tell them what to do? He must have something in mind. The nation’s central bank doesn’t need a pep talk to get it to do what it thinks best for the economy. The intended effect is probably to pressure the BOJ to stimulate the economy through quantitative easing by resuming its suspended purchases of government debt. He doesn’t have to come out and say what everybody already knows. Mr. Kan’s comments, however, highlight an irony. He is openly mocked for his lack of knowledge about economic affairs, an unfortunate shortcoming for a finance minister. He’s been on the job only since last month, so what little he does know has been what his minders in the Finance Ministry have managed to cram into him. Is he speaking out on his own, or is he just serving as a mouthpiece for the Finance Ministry bureaucracy? That’s where the irony reaches heavy metal proportions. It seems as if it’s been a half-century already, but just about two years ago, the Democratic Party of Japan, then in opposition, shot down every nominee offered by the Fukuda administration for senior positions in the Bank of Japan. Their justification was that they would not approve anyone with a Finance Ministry background. That reason does have merit. It’s a rule of thumb that fiscal and monetary policy should be kept separate, and governments often refrain from appointing Finance Ministry/Treasury Department veterans to central bank positions. Further, the Japanese Finance Ministry is the most powerful of the meddlesome Japanese bureaucracies. Two years ago, the opposition DPJ did everything in its power to prevent the Finance Ministry from putting their men in charge of the BOJ. Now the DPJ is the ruling party, and Mr. Kan has morphed into a ventriloquist’s dummy for the Finance Ministry to badger the BOJ. He seems so lifelike, too! HOW SERIOUS are Toyota’s problems? No, not the company’s media/issue-monger problems, the automobile’s engineering problems. It’s become clear that we won’t find out any time soon, now that the alliance of the Obama Administration/Labor Unions/GM ownership (the same thing), the Naderite parasites, and political scavengers such as Henry Waxman (who represents the Hollywood crowd in Congress) has grabbed the media megaphone. It took about 10 years to expose Ralph Nader’s campaign against the Corvair, after all. An intriguing aspect to the issue is that some in North America are taking Toyota’s side. The link lays out much of their case, including assertions that the car’s problems are not as serious as some claim. It also includes this bit from Canada’s Financial Post. The White House has denied any such motivation on the part of the United States. But that denial lacks credibility. While it may be technically true that President Obama’s team didn’t explicitly reach a decision to target Toyota, nobody in this crowd needs a presidential order to turn the Japanese auto giant’s Sudden Unintended Acceleration (SUA) problem into a national industrial advantage for the United States. The owners of union-dominated Government Motors can spot a strategic economic opportunity without waiting for the memo from head office. It’s good all the way to the end. By the time you reach the last sentence, the scales will fall from your eyes, as the Japanese say. When the late South Korean President Roh Mu-hyon started tanking in the polls, it wasn’t long before the anti-Japanese rhetoric emanating from the peninsula grew louder and more heated. Purely by coincidence, of course. ‘Twas ever thus. Demagoguing the foreigners is one of the few arrows rattling in the quiver of third-raters made desperate by their unpopularity. While Mr. Obama may not be handling the chores personally, his political supporters and the palace guard of the media who worked so hard to install him are more than happy to volunteer. Nothing else is working. UPDATE: There’s more from John Stossel. The scare-of-the-day is always used by politicians to grab power. But to put the Toyota problem in perspective, before all the media hype, 19 fatal accidents were linked to faulty gas pedals and floor mats over the last decade. That’s fewer than 2 each year. Compare that to America’s 40,000 annual fatal car crashes. Try Googling “Toyota accelerator defect.”…(A)s (I) wrote this, six out of the top ten hits are from law firms soliciting business…Personal injury lawyers spewed junk science about breast implants and asbestos and got juries to award billions. The Toyota circus may be no different. Once the media-politician-lawyer cabal is inflamed, hysteria and greed eclipse rational analysis. HERE’S AN IDEA so good it’s a shame the potential applications are limited. 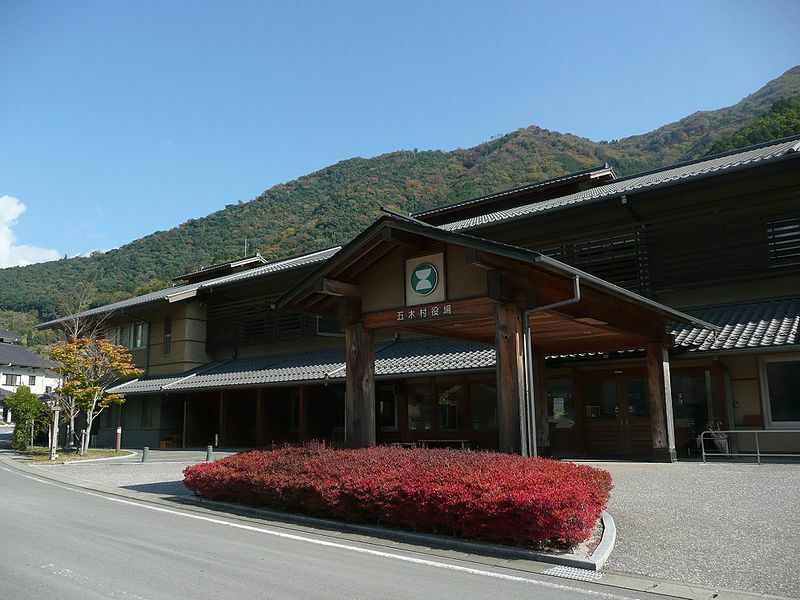 The members of the municipal council of Itsuki-mura in Kumamoto have agreed in principle on a plan to base their salaries on job performance. The village residents will form a committee to evaluate the council members as “excellent”, “good”, or “ordinary”. The bill to amend the law governing council member remuneration will be presented to the municipal council in March, and everyone expects it to pass. A spokesman for the National Association of Chairmen of Town and Village Assemblies says they’ve never heard of a local governmental assembly in Japan with a performance-based salary system, and they think Itsuki-mura will be the first in the country to adopt one. Some villagers came up with the idea last December because they wanted to provide incentives for the council members to conceive and implement the drastic steps they believe are needed to revitalize the community of 1,400. Many of the villagers moved away in recent years because the central area was to have been flooded with the construction of the Kawabe River Dam. But that dam was one of the many construction projects suspended by new Land, Infrastructure, and Transport Minister Maehara Seiji after taking office with the new government last September. As you might well imagine, that made a mess of the village’s municipal planning. The measure will call for the evaluations to take place at the end of every fiscal year. The council members’ current monthly salary of JPY 210,000 (about $US 2,300) will be cut 20%. Those who receive an “excellent” rating will receive an extra JPY 516,000 for the year, the “good” ones will get JPY 258,000 extra, and the “ordinary” ones will get a bundle of switches instead of Christmas presents, but no money. In yen terms, those rated excellent will wind up with about as much in salary as they do now. The evaluation committee will use minutes from the council meetings to make their decisions, and they will examine the questions raised, the bills presented, and the members’ participation in community activities outside of municipal government. The chair and vice-chair will also be judged on their leadership abilities. The names of the committee members will not be made public, and there will be no appeal of their decisions. The villagers have yet to decide whether to publicize individual evaluations. The report contained no information on the procedures for choosing the evaluation committee members. The current council chairman allowed that problems with the system would probably arise, but their immediate objective is to revive a village that was nearly wiped off the map. This plan sounds as if it would work well for small municipalities, though the potential for abuse exists if the committee members let personal grudges interfere with their evaluations. In a village that small, everyone knows everyone else to begin with. In a larger municipality, party politics would probably cause some problems, thought that’s unlikely to be a factor here. Another drawback is the lack of a “bad” evaluation category. There are stinkers in every village on the planet, and designating “ordinary” as the lowest rating smacks of grade inflation. Nonetheless, it does sound as though it’s worth a try. Financial incentives do tend to focus the mind, and Itsuki-mura is a lovely place to judge from the photos. It’s also a good thing I’ll never be asked to join that evaluation committee. With the financial incentive, you just know somebody will try to boost their take-home pay by coming up with all sorts of legislative proposals just to make themselves look good. I’d be tempted to take points away from those people on general principle! THE CHINESE are increasingly choosing not to live happily ever after, according to a report today from the Beijing correspondent of the Nishinippon Shimbun. Recently released figures show there were 30,000 divorces in Beijing last year. That represents a six-fold rise in eight years, from the 5,000 divorces in 2001. In addition, the Civil Affairs Ministry said the number of uncontested divorces nationwide in 2009 totaled 1.71 million, a 10% increase from the previous year. Cited as the primary reasons for the skyrocketing divorce rate were the “diversification of values” resulting from economic prosperity, and the simplification of divorce procedures in 2001. The Beijing court handling divorce cases said the reasons the couples most frequently gave for ending their marriages were spousal abuse and adultery. The figures show one more possible reason, however. A significant number of those getting divorced were children from one-child families born since 1980. Roughly 20% of the couples had been married fewer than three years, and 30% fewer than five years. The Beijing court reported that one-third of the divorces were of couples 25 years old or younger. To be sure, greater prosperity and freedom brings higher divorce rates everywhere. But does anyone doubt that children who grow up without siblings will be less prepared than others to smoothly negotiate the sometimes tricky waters of the daily give-and-take of marriage? Particularly when their partners are only children themselves. A DISAGREEMENT between the ruling Democratic Party of Japan and the opposition Liberal Democratic Party over the leadership of the Japan-Korea Parliamentarians’ Union is preventing the organization from functioning, the Kyodo news agency frets. Former prime minister and LDP member Mori Yoshiro heads the group, but the DPJ thinks someone from their ranks should assume the chairmanship now that they are the party in power. Two possible candidates from the DPJ are the speaker of the lower house and the president of the upper house–in other words, two people in largely ceremonial roles for a role even more ceremonial and insignificant. Of course the standoff is childish, but politicians are no less immune from childish behavior than anyone else, and more prone to it than most. For some reason, Kyodo thinks it’s important. In parallel with government-to-government contacts, the Japan group and its South Korean counterpart have contributed toward an improvement in bilateral relations. Apart from regular exchanges of visits by the top leaders of the unions, lawmakers from the two parliamentary groups have helped lower political tensions that from time to time have gripped the two countries, mostly as a legacy of acrimonious historical ties. Is it a coincidence they cite no examples of how these two groups have lowered political tensions? If there were any examples, why hasn’t Kyodo been filing reports on them all along? One would think the minimum standards of journalism would require them to offer their consumers brief descriptions of one or two instances in this article, but then they always expect us to take their word for it, don’t they? What lowers political tensions between the two countries are ongoing daily business, academic, scientific, and cultural exchanges, as well as the brisk traffic in tourism. The cumulative effect of all that interaction, conducted with little or no fanfare, is the most important factor creating friendly ties between the two countries. Try the Japanese-Korean Amity category on the left sidebar for samples. If the politicians want to search for the usual source of any tensions that arise, they should listen to recordings of themselves posturing for the electorate. It’s typical of the dinosaur mass media to think that an idealistic-sounding excuse for political junkets to enjoy banquets with food and drink paid for by other people, and justified by self-important speeches written by aides and listened to by no one, would have as much of an impact on bilateral relations as the daily interaction of people in their respective fields of endeavor. It’s the same sort of illusion that pretends UN Security Council meetings, Copenhagen climate change conferences, and G7 or 8 or however-many-there-are-now summits have much of an impact on anything except the hotel and catering business. While the two groups are harmless, albeit a waste of money, Japanese-Korean relations would not deteriorate in the slightest if they were to evaporate tomorrow. The people in both countries who actually are enriching and strengthening bilateral ties will continue to do so by pursuing their mutual interests.